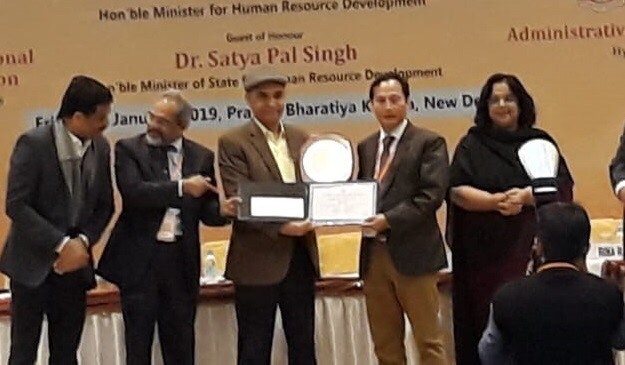 The block education officer (BEO) of Lower Dibang Valley in Arunachal Pradesh Obang Langkam was felicitated with a national award for innovation in educational administration in New Delhi recently. Langkam was felicitated by the National Institute of Educational Planning and Administration (NIEPA) in presence of the union human resource development minister Prakash Javadekar and minister of state Satyapal Singh. Langkam was conferred with the prestigious award in recognition and appreciation for his concept paper titled ‘Academic Action Plan’ which is successfully being implemented in many schools of the Lower Dibang Valley district since the year 2014. Doye hoped that such national level recognition of a district level officer will go a long way in boosting up the moral of education officers working in remote pockets of the district and the State. This recognition will act as a catalyst and motivate a lot of others to work harder and with full sincerity and dedication thereby bringing a visible improvement in the educational system and scenario of the district and state, the DDSE said. The scheme of National Awards for Innovation in Educational Administration is one of the important initiatives of the NIEPA. It aims to reach out the grassroots educational functionaries at district and block level for recognizing the contribution of the field level educational administrators in improving and strengthening the functioning of the public education system. Since its launch in 2014, many innovative ideas and good practices have been shared by participants from different states and UTs and have been awarded for their significant contribution.